White Shorthaired Cats have always been much prized for the purity of their coats, and in many countries are regarded as a symbol of perfection. As in the White Longhair, the blue-eyed variety is genetically predisposed to deafness. The modern breed originates from the selective breeding of street cats during the late nineteenth century. As one would expect from its origins, the British White Shorthair is intelligent and street-wise, as well as making a friendly companion. There is a trio of varieties: Blue-eyed, Orange-eyed and Odd-eyed. (non-pedigree, shorthaired white cats usually have green eyes). A perfect white shorthair with no hint of any other color is a relatively rare, and therefore sought-after, animal. The orange-eyed variety, which does not suffer from the problems of deafness associated with the blue-eyed types, is regarded even more highly. The fur is short and dense. The color should be pure, snowy white, and without any tinge of grey or yellow. The paws are large and round, with pink pads. Round and broad, with a well-developed chin, a straight nose, and a pink nose pad. Large, round, and orange-colored; each eye should be equal in depth of color. Medium-sized, round-tipped, and set well apart. 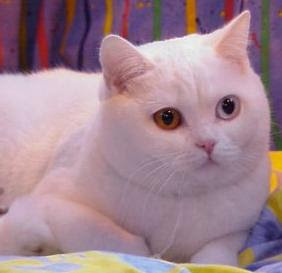 The variety of British White Shorthair that has one orange eye and one blue eye is a side-effect of breeding programs designed to produce orange-eyed cats with perfect hearing. Deafness may be apparent on the blue-eyed side.